Simon and I arrived at the same time from different directions, and Steve was already enjoying himself on a Flexifoil stacker. 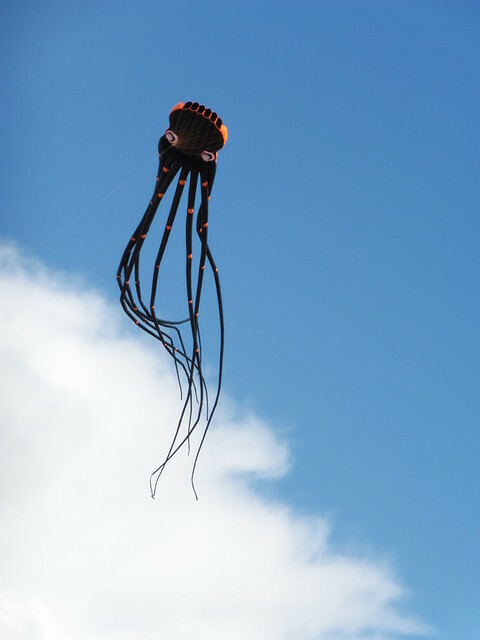 We quickly set up, and soon had kites flying in the stiff breeze Simon's choice was an octopus, mine a flowform. 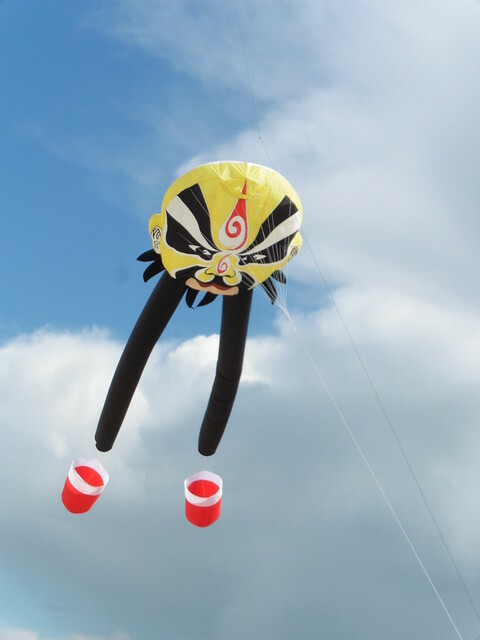 The breeze was much stronger than expected, but not to be defeated, I added a Beijing opera mask from Weifang Kites. Simon added another lifter and ran an astronaut up the line. But before long, the lifter made a break for freedom. The two kite lines had become entangled and while trying to release them the friction had melted the weaker line. Fortunately, a lady walking her dog along the shore saw the kite come down and held on to the line to prevent it going out further onto the sand. 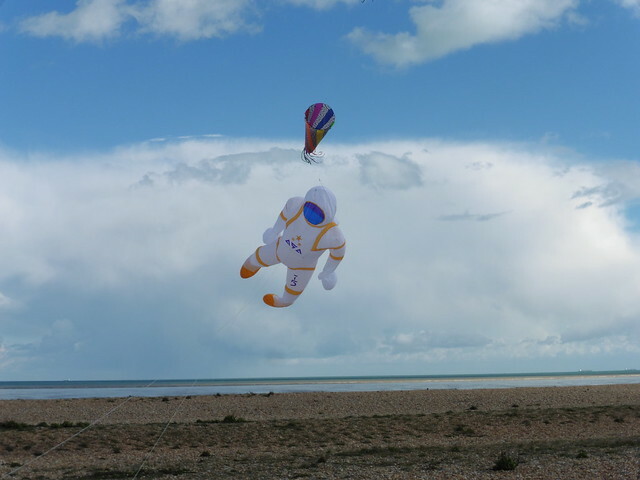 Steve went to rescue it, and before long the kite was in the air again being dried out. Then it got swapped for a trilobyte. After a little while, the octopus decided it wanted to head back to the sea. If managed to make its way about a hundred yards offshore onto the wet sand, but was unable to get out to the low tide, and being soaking wet, wasn't going anywhere. Fortunately the sand is pretty firm for the most part, so the recovery was effected. The line was swapped out for much heavier line, and soon the octopus was back in the air drying out. Meanwhile, I'd swapped out the flowform for a powersled 24, which was pulling quite hard, and easily coped with the other opera mask. Bill had arrived in the meantime, along with Barry, Janet and Mike, so we had quite a crowd gathering, and had also attracted quite a number of onlookers watching the kites. The opera masks had launched easily, but when it came time to bring them down again, the strength of the wind soon became apparent, and it took two of us to wrangle each of them down and into their bags. All in all a great afternoon flying. Looking forward to doing it all again soon.